Woods café isn’t what you would class as a ‘typical biker café’ but with its stunning location and great food, it had to be included! 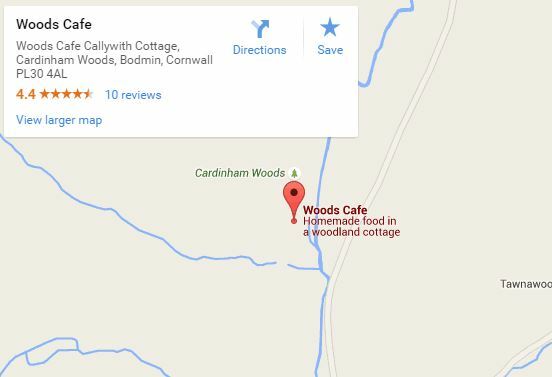 Woods café is an independent family run café situated in Cardinham Woods, Cornwall. Hidden between the trees, you’ll find the cottage-styled café with large outdoor parking area and plenty of seating. It’s mainly popular with walkers and cyclists, but if you’re touring around the Cornish coast then it’s well worth a stop. The menu might be small but all the ingredients are local sourced with the food made fresh to order. If you’re just popping in for a quick cuppa between your ride then make sure you try a slice of the freshly baked cakes on offer; the cakes are baked fresh every morning with some of the favourites being carrot with orange cream cheese icing, fresh cream Victoria sponge, lemon and berry drizzle and the infamous chocolate brownies. Woods Café is open between 10.30am – 4pm, with extended hours during the summer months. As we said this isn’t your classic biker haunt but if you’re looking for something quirky then try the Woods Café.